For the historic county, see Flintshire (historic county). For the racehorse, see Flintshire (horse). 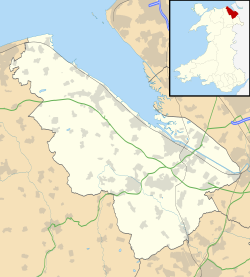 Flintshire (Welsh: Sir y Fflint) is a principal area of Wales, known as a county. It was created by the Local Government (Wales) Act 1994. It is in north-east Wales, bordering the English county of Cheshire to the east, Denbighshire to the west and Wrexham County Borough to the south. It is named after the historic county of Flintshire which has notably different borders. Flintshire is considered part of the Welsh Marches and formed part of the historic Earldom of Chester and Flint. The county is governed by Flintshire County Council based in county hall Mold. The largest town in the county is Connah's Quay, followed by Flint, Buckley and Mold. Flintshire takes its name from the former county of Flintshire established in 1536 which existed until 1974 when it was abolished under the Local Government Act 1972. Its re-establishment in 1996 under the Local Government (Wales) Act 1994 does not follow those original boundaries and covers a smaller area. At the time of the Roman invasion, the area of present-day Flintshire was inhabited by the Deceangli, one of the Celtic tribes in ancient Britain, with the Cornovii to the east and the Ordovices to the west. Lead and silver mine workings are evident in the area, with several sows of lead found bearing the name 'DECEANGI' inscribed in Roman epigraphy. The Deceangli appear to have surrendered to Roman rule with little resistance. Following Roman Britain, and the emergence of various petty kingdoms, the region had been divided into the Hundred of Englefield (Welsh: Cantref Tegeingl), derived from the Latin Deceangli. 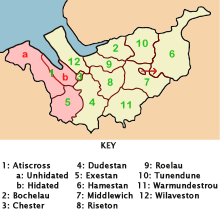 The Domesday Hundreds of Atiscross and Exestan later forming the principal area of Flintshire are shown in pink. It became part of the Kingdom of Mercia by the 8th century AD, with much of the western boundary reinforced under Offa of Mercia after 752, but there is evidence that Offa's Dyke is probably a much earlier construction. By the time of the Norman conquest in 1066 it was under the control of Edwin of Tegeingl, from whose Lordship the Flintshire coat of arms is derived. Edwin's mother is believed to have been Ethelfleda or Aldgyth, daughter of Eadwine of Mercia. At the time of the establishment of the Earldom of Chester, which succeeded the Earl of Mercia, the region formed two of the then twelve Hundreds of Cheshire of which it remained a part for several hundred years. Flintshire today approximately resembles the boundaries of the Hundred of Atiscross as it existed at the time of the Domesday Book. Atiscross, along with the Hundred of Exestan, was transferred from the Earldom of Chester to the expanding Kingdom of Gwynedd from the west in the 13th century following numerous military campaigns. This region, as well as an exclave formed from part of the Hundred of Dudestan (known as Maelor Saesneg), later formed the main areas of Flintshire, established by the Statute of Rhuddlan in 1284 under Edward I. It was administered with the Palatinate of Chester and Flint by the Justiciar of Chester. The county was consolidated in 1536 by the Laws in Wales Acts 1535–1542 under the Tudor King Henry VIII, when it was incorporated into the Kingdom of England. Flintshire remained in existence until 1974 when it was merged with Denbighshire and Edeyrnion Rural District to form the administrative county of Clwyd. Clwyd was abolished 22 years later and Flintshire reorganised in its present form in 1996. However, some parts of the historic country are not included within the present boundaries of Flintshire: significantly English Maelor was incorporated into Wrexham County Borough, and St Asaph, Prestatyn and Rhyl into Denbighshire. The district of Rhuddlan, which was also formed entirely from the administrative county of Flintshire was included in the new Denbighshire instead. Other parts of the pre-1974 administrative Flintshire to be excluded from the principal area are the Maelor Rural District and the parish of Marford and Hoseley, which became part of the Wrexham Maelor district in 1974 and are now part of Wrexham County Borough. See List of places in Flintshire for a list of towns and villages. Flintshire is a maritime county bounded to the north by the Dee estuary, to the east by Cheshire, to the west by Denbighshire and to the south by Wrexham County Borough. The coast along the Dee estuary is heavily developed by industry and the north coast much developed for tourism. The Clwydian Range occupies much of the west of the county. The highest point is Moel Famau (1,820 feet/554 metres). The chief towns are Buckley, Connah's Quay, Flint, Hawarden, Holywell, Mold, Queensferry, and Shotton. The main rivers are the Dee (the estuary of which forms much of the coast), and the River Alyn. Located on the North Wales Coast Line (Holyhead to Chester) with services run by Virgin Trains and Transport for Wales specifically calling at Flintshire stations such as Flint and Shotton with an interchange at Shotton with the Borderlands Line, which links other Flintshire stations with the Liverpool area. Parts of Flintshire have major manufacturing industries. Amongst these are an advanced Toyota plant that manufactures engines, Shotton Paper, and Airbus, making the wings for the A330 and the A380 at Broughton. There are daily flights of the Airbus Beluga transport aircraft of Airbus wings from Broughton for the smaller aircraft. The wings for the A380, which are too large to be transported by air, use a multi-modal transport using Flintshire's roads, the River Dee and the port of Mostyn, also in Flintshire. Flintshire is also known for its internet companies, the largest and most well known being Moneysupermarket.com based in Ewloe. Flintshire included much of the North Wales Coalfield, with the last colliery at Point of Ayr closing in 1996. Flintshire is home to Shotwick Solar Park, the largest Solar array in the UK, built on the south west edge of the Wirral Peninsula. It has a maximum generating capacity of 45 MW. Flintshire was home to a thriving Steel industry with many of the local communities and homes being built around this sector. This came to an end in 2018 when the counties largest former British Steel plant which had been sold to TATA Steel closed down with a loss of 6,500 jobs in North Wales. On 19 November 2004, Flintshire was granted Fairtrade County status. Flintshire County Council is the Local Education Authority of Flintshire. It runs 72 primary schools, 2 special schools and 11 secondary schools. Six of the primary schools and one comprehensive are Welsh medium schools. Four of the secondary schools have come together with Coleg Cambria to form the Deeside Consortium. Flintshire's local newspapers include two daily titles, North Wales Daily Post and The Leader. There are two radio stations broadcast in the area – Communicorp station Heart FM and Global Radio station Capital North West and Wales broadcast from the studios based in Wrexham. Whilst BBC Cymru Wales runs a studio and newsroom for their radio, television and online services located at Glyndŵr University but does not base their broadcasting there. An online news website covering the Flinsthire area, Deeside.com, operates from Deeside. ^ "The Celtic tribes of Britain". Roman Britain Organisation. Archived from the original on 26 December 2001. Retrieved 3 May 2014. ^ "Offa's Dyke: built by multiple kings?". Current Archaeology. XXV, No. 3 (291): 6. June 2014. ^ Higham, Nick (1993). The origins of a County. Manchester University Press. ISBN 0-7190-3160-5. ^ "Index of /search/". domesdaymap.co.uk. Archived from the original on 23 April 2014. Retrieved 1 May 2018. ^ "Events that shook North Wales: How Shotton steelworks closure saw 6,500 jobs lost in one day". The Daily Post. 21 July 2018. Retrieved 13 December 2018. Wikimedia Commons has media related to Flintshire. Wikivoyage has a travel guide for Flintshire.